Notes: Click here to read about the development of Arne's palette, and to see some great little mockups by Arne and Tomas. 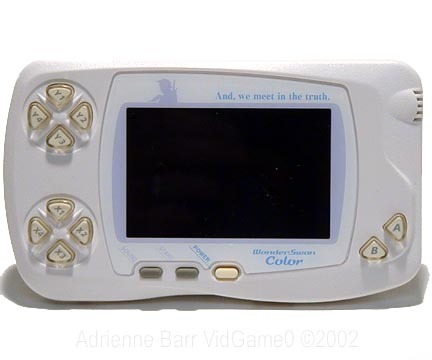 224x144 is the resolution used by a little-known portable console called the Wonderswan Color. However, I have no idea what the specs are for that machine, nor do I care! As for the theme...you're free to interpret it however you choose...I am looking forward to seeing some creative interpretations this time 'round!! Ah, .TakaM has just informed us that the screen was frequently used portrait-style, so 144x224 mockups are happily welcomed as well. Good luck! Is this your first Mockup Frenzy? Why not check out the rules & results from Mockup Frenzy #1: Mobility!, Mockup Frenzy #2: Ninjas!, and Mockup Frenzy #3: GB Demakes! Great job everybody! Sorry about the whole "no banner" thing...I will definitely have one for MF5!! Humm, new interresting challenge and a nice palette too! invasion = space invader's like? and Adam, where is the new banner? As for the theme...you're free to interpret it however you choose...I am looking forward to seeing some creative interpretations this time 'round!! But I thought I'd post it here just in-case I decide to finish it up. If I have another update it will probably have some aliens in it. That's exactly what I first thought of ptoing. this palette is so not me, but this topic so is! basic hack'n'slash with RPG elements, it's the Viking Invasion!! blue guys are yours, drab guys are theirs, right now only 1 unit, a good viking swordsman. the floating ring indicates he is one of your controllable Thanes (you can have AI helpers as well in your battles). That is a thing of beauty, Adarias. Particularly 2x. Makes me wish you'd use more standard palettes more often. my turn, the giant invasion of tomatoes !!! Carrot is looking way too penile right now. I've got a pretty rough WIP, placeholding the first page. Marco, retired intergalactic bounty hunter, wakes up one day in his cozy summer house finding his home planet under attack by weird aliens in tin cans labelled NASA. Help Marco defend his planet from the intruders with his GooTastic home appliance, that he got for christmas last year. It's pretty empty right now, or at least missing a HUD. Feel free to make any suggestions at all. I'm pretty new at this, and have just been studying the fine artists of this forum and I love all the critique you guys give. It's seriously awesome. Oh, and hi everyone. My first post here..
Update: A slightly more alien-like colour scheme, and earthlings! So you can base your mockup on the actual buttons, if you so wish. I should definitely get summin in this time. Working on some platforming shooter. obvious WIP. Helm thats really cool I like those types of game, the only thing wrong is that it is hard to read it at x1, at x2 it looks more readable, probably because all the objects are to close together. A generic mock-up but I wanted to try the palette out.